The Rochor River used to be an important waterway for the timber industry and many sawmills and wood factories could be found along its banks. Logs from Indonesia and Malaysia used to be transported to their designated industries through this river. However, such activities declined by the 1970s due to redevelopment. The river is currently under the government’s “Active, Beautiful, Clean Waters Programme”, and will be transformed into a vibrant waterway lined with pedestrian-friendly promenades. Kallang River got its name from the Orang Biduanda Kallang who lived in boats amidst the swamps and waterways until the early 19th century. They were boat dwellers who avoided the sea and made a living fishing near the mouth of the river. 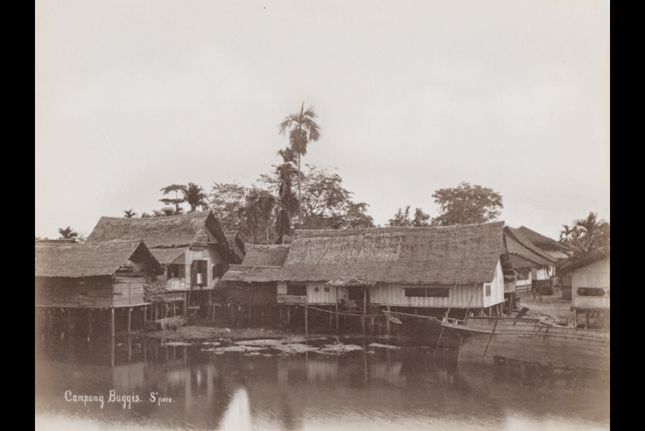 As the port town developed, new settlements started to sprout along the banks of the Kallang River, many of which were kampongs settled by the Bugis or Orang Laut (“People of the Sea”). The Bugis initially settled in Kampong Glam around the Sultan’s istana but were relocated in 1823 to the present-day Beach Road Garden estate and Beach Road area. Bugis trade was a distinctive feature of the port town from the early 19th century. They would dock their prahus (sailing vessels) along Beach Road and Kallang River, and trade goods that included opium, gold, textiles, bird’s nest, spices and earthenware. Most of the waterfront kampongs were demolished in the 1930s to make way for the Kallang airport.